I've been a fan of Tastefully Simple for quite a while now. I made some really terrific white barbecue chicken with their luau dip mix (which was also a great chip and veggie dip as well). Tastefully Simple checked to see if I'd like to try out some of their new products for this grilling season. I'm usually game to do so and give an honest opinion. I've always loved raspberries. When we visited the relatives when I was a kid, they would take me picking berries (mostly eating for me) and would keep getting me to say what they were. I called them RAUS-berries. So, the relatives all thought I sounded very city-fied, and I cracked them up with my mini foodie self. Of course, I had to break open the Tastefully Simple Raspberry Sauce which does have jalapenos but not enough to run off many. You get just a hint of heat but not really any hot which works for me on this flavor combo. Raspberry Jalapeno sauce is billed as a barbecue sauce or a table dipping sauce. I'd have to agree that it works both ways, so even if you don't barbecue grill, you can still get some great flavor here. 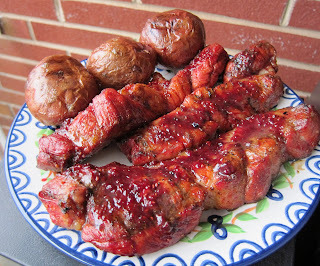 Of course, I was going to grill with the Raspberry barbecue sauce, because . . . hey . . . that's what I do. And, that's really the only way I know how to tell you how a barbecue sauce really tastes. Fire up the grill and use it. I had some country ribs which are an odd cut and inexpensive but with a lot of meat for the money. The flavor is close to pork chops. Also, these are not true ribs, so they don't have to grill or smoke for near as long. These were on maybe 45 minutes to an hour on low heat. First I smoked the ribs until close done. This can be done with charcoal or gas (just low on the temperature). The last fifteen minutes or so I added the Tastefully Simple Raspberry BBQ sauce. Sauces with sugar will burn if you put them on for the entire grilling time. Having smelled and taken a little bite of the barbecue sauce beforehand, I sauced only one side of the country ribs. This is a sweet sauce, and one side was just perfect for us. If you have a real sweet tooth, you could go heavier and sauce up both sides. I'll stick with one side as the balance was just right here. What Did We Think of the Raspberry Barbecue Sauce? First, I must say that this is a beautiful barbecue sauce. I rarely go there on the blog. But, if you look at the photo at the top, you'll see what I mean. Wow. That's just a point and shoot camera on my front porch and no PhotoShop. The ribs looked just like that (or better). The flavor was as good as how the country ribs look. Although I do suggest going light on the amount with the sweetness, the overall flavor was something to write home (or on FaceBook) about. The rich raspberry flavor with the hint of heat was spot on. I love a lot of grilling seasoning, spices, rubs, oils and sauces. There are just a very few that I count top picks. This is one, so you know I loved it. Then again, I do go way back as a raspberry fan, but I do think it would be hard not to love this special barbecue or dipping sauce. 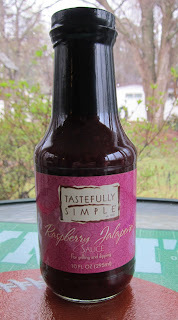 Here is the bottle for those looking for Tastefully Simple Raspberry. I know it helps me when I know what to look for on the shelf. 'Country ribs' are definitely big in this area. Not a true rib, as you say, and a lot of pork chop flavor. Sounds like they would be good with this product. I hear the beef and pork 'industries' are trying to rename a lot of the standard cuts. Wonder how that will shake out with consumers. I never really had a problem with 'pork butts'..!! How does it differ from all of those chipotle raspberry BBQ sauces out there the past few years? I'm guessing with straight jalapeno it might be a little cleaner taste but a little more bite? Good review as always! Hi Tom - Yes. The names of meat will be changing, and I'm guessing the prices will go up. Sure. They will go up but even more with fancier names. The great thing about grilling is that you can take the lower priced meats and make them taste wonderful, and grilling is healthier with the fat dripping off. So, I'll just count my blessings and the good grilling stuff. Raspberry is a very beneficial type of fruit. Mixing it up with barbecue would be helpful in alleviating arthritis and it is also diet-friendly. With this you wouldn't have to be very conscious about having a little more of meet. Grilled foods are better than fried. Thanks for the post. Love the idea of raspberry. Yes Antoine... grilled is better than fried.